Autopia Bloomington is a full-service, independently owned and operated, preventive maintenance and auto repair center. Conveniently located at 9480 Lyndale Av S, Autopia has a long history of providing high-quality auto maintenance, car repair and vehicle service on Twin Cities’ area cars, light trucks, vans and SUVs. Autopia is very much like the car repair shops of old – a garage where you know and trust your mechanic, feel comfortable asking questions, and where you can count on getting fair prices and high-quality workmanship. Except today, instead of one or 2 lifts, we have 8 modern bays equipped with state-of-the-art electronic testing equipment, tools, computers and environmental safeguards. As a full-service car maintenance and auto repair garage, our ASE-Certified technicians are skilled across the spectrum of makes and models of imported and domestic vehicles including Ford, Chrysler, Honda, VW, AMC, Chevy, GM, Isuzu, Toyota, Jeep, BMW, Hyundai and others. We maintain and repair virtually all engines including the newest diesel, hybrids, duel-fuel, and high-performance engines. Part of what sets Autopia apart is our commitment to serving customers well. Read Autopia’s Customer Bill of Rights and you’ll know how important we think customer satisfaction is. Listening, really understanding our customers’ concerns, is the first step to providing good service. In order to meet your expectations, we need to make sure we’re on the same page. And because we value your business and believe in continuous improvement, we welcome your feedback and comments. We encourage you to ask questions — we’re always happy to share our knowledge — because we believe that the more well-informed you are, the better care you’ll take of your vehicle, the fewer costly repairs and the more you’ll trust and understand our advice and service. Autopia can help you maintain your auto’s safety and reliability across its lifecycle. Not only does that make your life a little easier, it keeps a few more dollars in your pocket – a well maintained vehicle costs less to operate and retains its value better. Whether you have an older car that’s been around the block more than once, or a newer SUV, van or wagon that hauls the kids everyday, you want to make sure it’s safe, starts reliably and is getting the best gas mileage possible. We’ll develop an individual maintenance schedule tailored to your car’s needs and try to schedule your visits to accommodate your busy life. “A new level of car service you’ve only dreamed about” is not just a slogan. We work to make it a reality for every customer, every time. Autopia has been maintaining and repairing autos in Bloomington and surrounding Twin Cities’ communities since 1975. From the very beginning, Autopia focused on delivering high-quality auto care with an emphasis on service and customer satisfaction. John Hertsgaard acquired the business in 2006. He and his wife Louise were both attracted to Autopia’s goal of total customer-satisfaction. They had just returned from overseas where John worked as the Design Manager for the Swedish-owned Tetra Pak International. Previously, he’d been with Honeywell and Chrysler in Detroit. But he was ready to leave the corporate life and Autopia seemed like the right fit. Autopia was the perfect intersection of three of John’s major interests. His formal education includes a Mechanical Engineering degree from the U of M and an MBA from St. Thomas. That technical background merged with his life-long love for all things automotive and a growing desire to be an independent business owner. 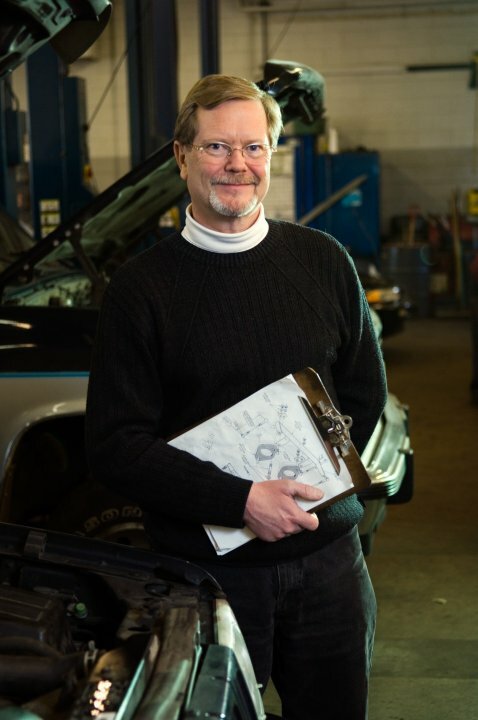 Possessing the disciplines of engineering gives him a unique perspective on automobile maintenance – he takes a more holistic view, understanding the systems, their interactions, dynamics, and the principles underlying them. But for John, owing Autopia is much less about technical engineering issues and math formulas…it’s about cars! John has an ongoing passion for classic sports cars and vintage racing car. Not just a fan of racing but an avid racer himself, he has raced in the USA and while in China, discovered the fun of go-kart racing. Not surprisingly, Autopia reflects John’s passion for imports, foreign-made sports cars, European-racers and high performance vehicles. Twin Cities import enthusiasts know that Autopia delivers the kind of TLC and personal interest they want from their auto mechanics. Autopia’s goal is to provide drivers in Bloomington, Minneapolis, St. Paul and surrounding communities with first-rate auto repair and maintenance. It doesn’t matter whether you’re driving the latest, greatest car on the road or just trying to keep what you have running as best it can for as long as it can — Autopia will help you keep your wheels turning.